Midway through Cameron and Colin Cairnes’ 100 Bloody Acres, a character who’s tripping on acid and running for his life stumbles into a deserted Australian tourist attraction called Fairyland Village, where motorized versions of fabled characters lunge at him with leering menace. It’s a perfect encapsulation of the virtues of the Cairnes’ first feature and the limitations of their clockwork black comedy. When the audience meets Damon Herriman, he’s lugging the body of a car-crash victim into the back of his fertilizer truck, where it’s soon joined by three live ones—self-described “country girl” Anna McGahan, Oliver Ackland, and Jamie Kristian, all road-tripping their way to a music festival held on the Aussie equivalent of Yasgur’s farm. The boys go in back, locked in with dangling deer corpses and a human one buried under sacks of manure. (“It can get a little pongy in there,” Herriman warns them.) McGahan goes up front, where she and the twitchy Herriman bond over their mutual love of Slim Whitman. The Cairneses take their time building character and a sense of place before revealing what the audience has already guessed: The secret ingredient in the Morgan brothers’ trademark “blood and bone” fertilizer. (The logo on their truck reads, “We’ll fertilize ya!”) As a rule, Herriman and brother Angus Sampson, a towering, lugubrious lug with a bushy Amish beard, have specialized in predeceased raw materials, but the freshly killed accident victim turns out to be such a potent source of potassium that moving on to live specimens is only logical. How else is a pair of struggling small businessmen supposed to keep ahead of the competition? Much of 100 Bloody Acres is standard-issue meta-horror, riffing on movie-made assumptions about what happens when horny young people find themselves at the mercy of unbalanced rednecks. (There’s even a cameo by Wolf Creek’s John Jarratt.) But the Cairneses spin the clichés and then keep spinning them, pushing past in-joke irony to more surprising and occasionally unsettling territory. 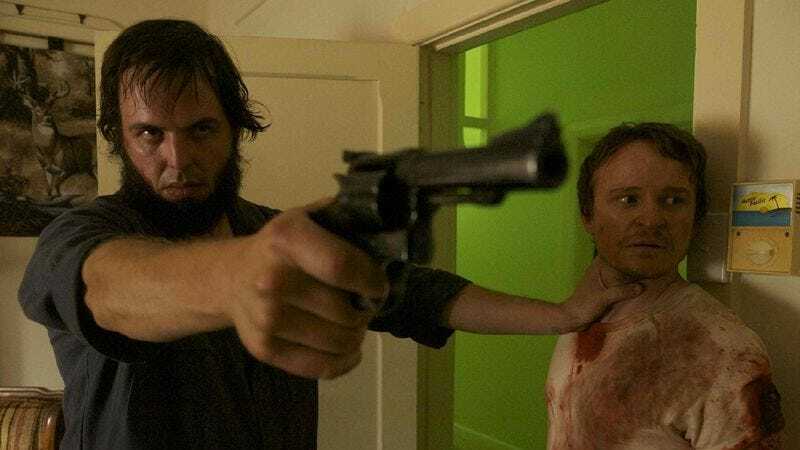 Herriman has the same dense stare he’s used to potent effect as Justified’s Dewey Crowe, but it’s mixed with a naïve indeterminacy that makes him more vulnerable and more dangerous: He’s lived under his big brother’s thumb for so long, he doesn’t know who he is. At its best, though not often enough, 100 Bloody Acres is as mercurial as its central character, breezily offbeat one moment, spattered in gonzo gore the next. It’s as if the filmmakers ground the bits of other movies fine enough that it made a rich foundation for their own.